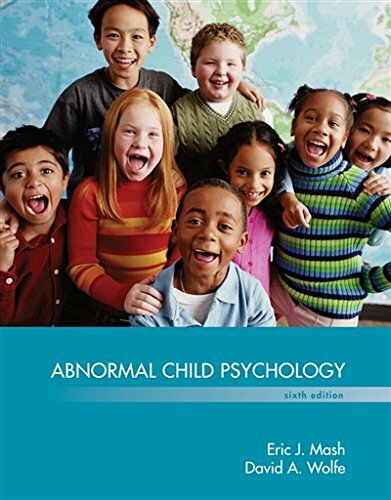 1305105427 -Through a thoughtful and accurate balance of developmental, clinical-diagnostic, and experimental approaches to child and adolescent psychopathology, Eric Mash and David Wolfe’s ABNORMAL CHILD PSYCHOLOGY remains the most authoritative, scholarly, and comprehensive book in its market. This edition has been organized and updated to reflect DSM-5 categories, as well as dimensional approaches to classification and evidence-based assessment and treatment. Accessible to a broad range of readers, the book traces the developmental course of each disorder. It also shows how child psychopathology involves biological, psychological, and sociocultural factors interacting with a child’s environment. Case histories, case examples, and first-person accounts are at the heart of the book, illustrating the categorical and dimensional approaches used to describe disorders and bringing life to the theories discussed. The authors also consistently illustrate how troubled children behave in their natural settings: homes, schools, and communities.